You have to admire the Bride and Groom who can put together a Destination Wedding, get their family who live in different parts of the USA and sometimes a foreign country, booked on a cruise, and then arrive in George Town and have their wedding go off without a hitch, with no stress, and the satisfaction of having the family say "This was perfect, it was just what we wanted and imagined." 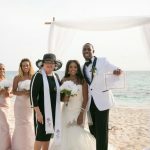 Of course many of these smart couples chose Simply Weddings - Grand Cayman Wedding Celebrants and Planners to ensure that their dream Cayman cruise wedding is perfect in every way. 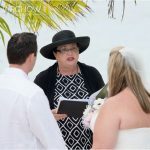 The most successful wedding day, is based on good communication, and being clear about your wishes and expectations, Peggy, our wedding coordinator takes care of all the details, and Joy, in addition to performing the ceremony will make sure you include all the traditional Caymanian wedding day traditions, and perhaps even some from your own country. 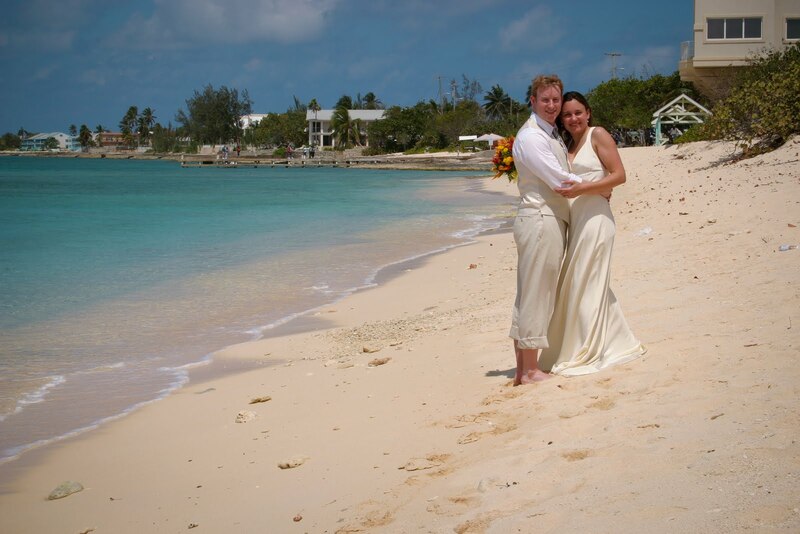 Your perfect wedding day in the Cayman Islands begins with the perfect wedding location. 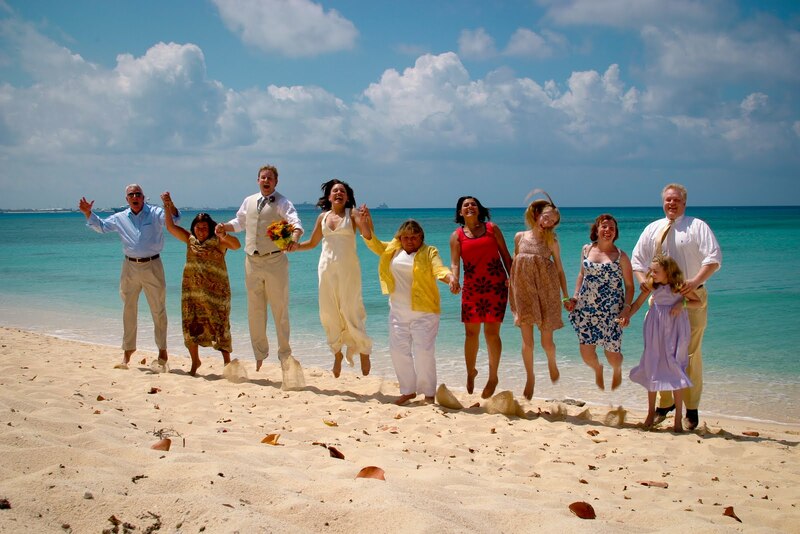 We can recommend the right spot for you, based on the size of your group, whether there are children included, and other details. We like this location in West Bay, known as Mary Molly Hydes Beach, at the western part of Seven Mile Beach. 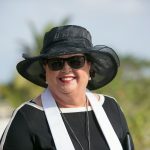 It is about 10 miles away from the cruise landing so you get a mini-tour of the Seven Mile Beach strip on your way. One thing about this location is that it is always quiet. 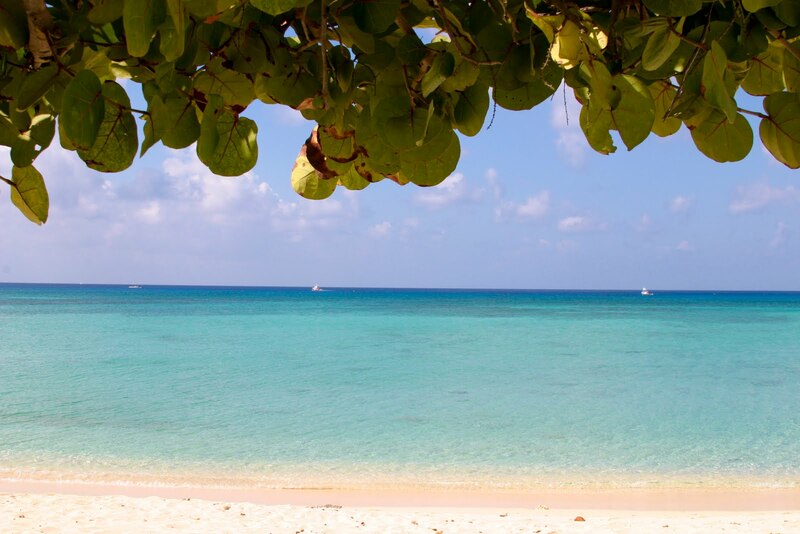 Right next door is Alfresco's Restaurant if you want to stay a while longer in this pretty spot. 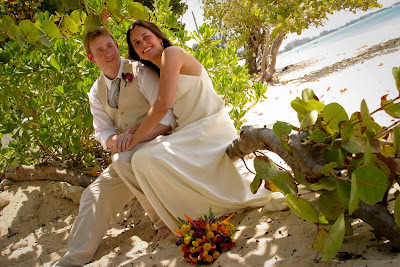 It was a bright, sunny day and we were happy for the shade of the sea-grape trees. 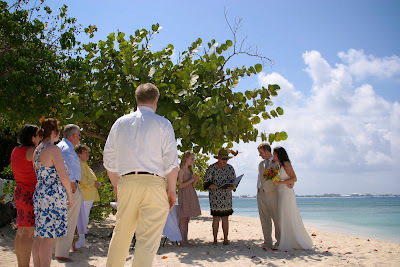 Words a groom loves to hear, "You may kiss your wife!" 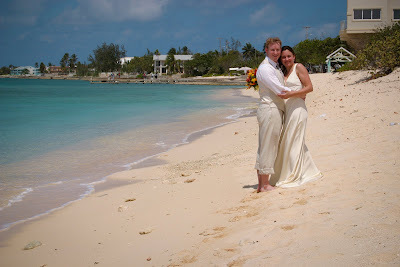 No worries about the legality of your marriage, a Cayman Islands Marriage Certificate is recognised all over the world. 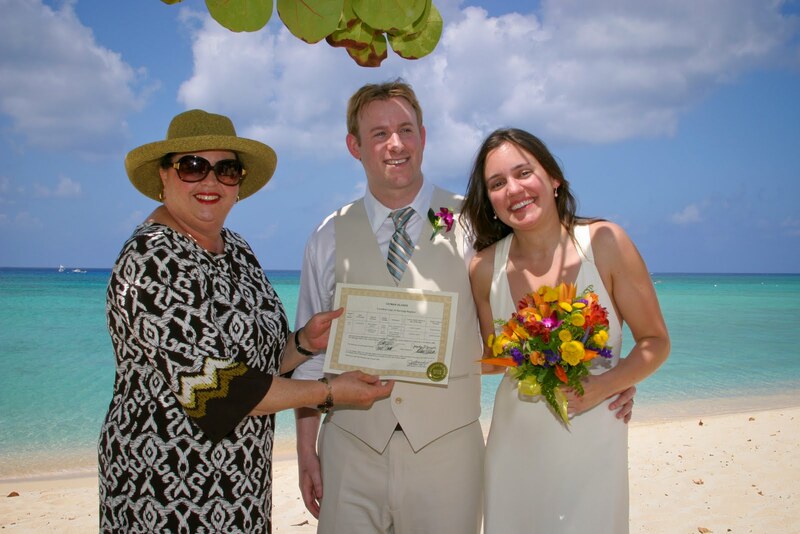 I usually register your marriage with our public records office the same day you are married, and we send you the "Registered Marriage Certificate" which shows that you were legally married in the Cayman Islands by a licensed Marriage Officer (me!) 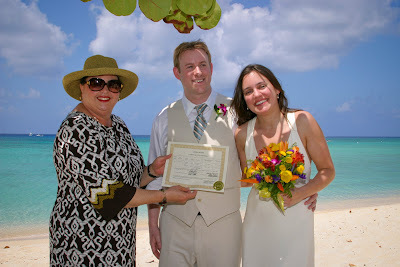 and your marriage properly recorded. This couple chose our most popular Cayman Wedding package, the "all-inclusive Cayman Cruise wedding" which includes all legal requirements, photography, wedding florals, champagne and transportation to and from the wedding location. 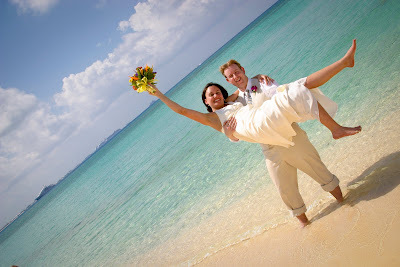 This package includes pick-up near the cruise landing, and dressing facilities in our Bridal Room. You can also leave your belongings at our office and come back after to change into your street clothes. Ask about our extended all-inclusive cruise wedding package with extra florals, wedding cake, videography, limousine, and whole-group transportation in a new, air-conditioned tour bus. 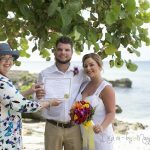 Our wedding services vendors today: Trisha's Roses, Mari of Island Photos, champagne from Cayman Corker, and Joselene's tours.